Talk to your venue about who could be getting married before or after you - maybe they'd like to share decorations with you? Or maybe just the cost of set-up and take down when it comes to lighting or ceiling decoration. No one says your wedding decor has to be exactly the same as the other couple, but if you're paying someone to hang lights and sheeting from the ceiling of your venue, maybe the couple after you could make use of it and pay for the removal of that decor? Or, if you're getting married in a church and have pillars, candleholders and/or floral arrangements at the head of the aisle, maybe the couple before or after you could take advantage of those items as well purchasing some of the items to share with you as well. You can still add you own personal touches with different coloured candles or accent flowers but the cost could be shared on those more utilitarian items. So often, the cost to assemble a centrepiece is the bulk of the purchase price - why do you think IKEA furniture costs so little! Absolutely, you're paying for the expertise, precision and professionalism when someone else assembles it for you but if your centerpiece is more of a simple and gorgeous design, you may consider buying the various pieces and assembling it yourself. Consider a bunch of peonies in a mason jar tied with a raffia ribbon? Maybe inexpensive glass vases with beach stones, shells and water, with a floating candle on top? Gorgeous and creative ideas you can assemble yourself. 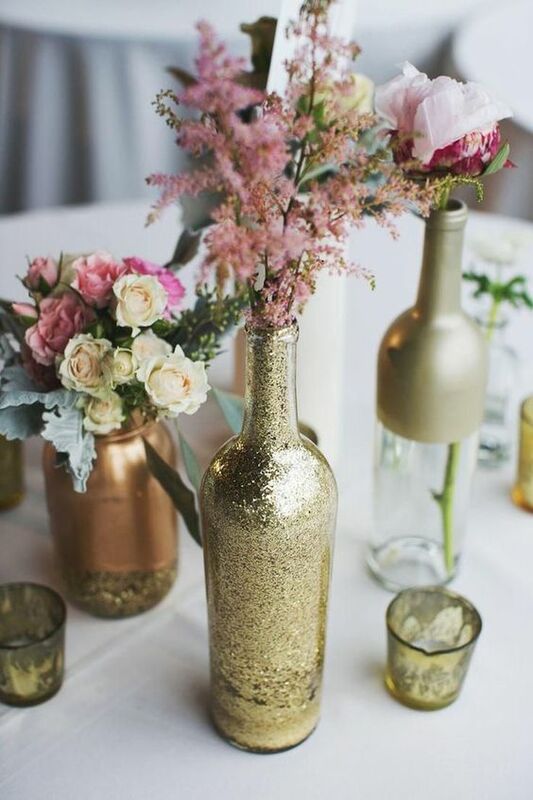 What about combing your centerpiece into a decorative statement for your reception table as well as the placecards and party favours for your guests? We've seen some couples preserve their summer farm market bounty into beautiful little jars of jam, complete with guests names on little tags, along with encouragement to the guests that the jars go home with them at the end of the day. Or picture frames with photos of the Bride and/or Groom posing with guests - a great way to decorate the place settings while specifying where the guests should sit. You could also bake your Grandmothers famous chocolate chip cookies, fill personalized bags adorned with your guests name, your names and the date of your wedding. Saving money on your wedding will definitely take some creativity, an openness to make some compromises and take a little extra time...but staying within your budget while creating your perfect day, will totally be worth it. Spectacular! Clad in our suits, we arrived here for the wedding and enjoyed every minute as we warmed ourselves in the comfort of good friends and joyful Holiday cheer. These truly are magical New York wedding venues for a special evening.